Patricia “Pat” Beattie (Hanna) passed away in Boston, Mass., on Saturday, Oct. 26, 2013, at the age of 89. Known affectionately by her family and friends across the country as “Boom Boom,” Pat was born in Rochester, N.Y., on March 14, 1924. She grew up in Rochester and Wayland, N.Y., raised her children in Greenwich, Conn., and later became a longtime resident of Sun Valley, Idaho. Pat had an enduring love affair with the American West and the Idaho Rockies. She piloted small planes across its deserts, skied and rock-climbed its mountains, hiked its forests with her dogs and horses –and kept it all up well into her 80s. At home, she entertained her many friends with humorous conversation, witty correspondence and memorable dinner parties. Her light burned bright and long. 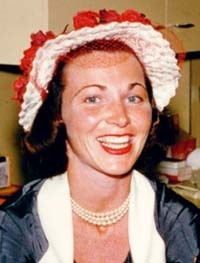 Pat is predeceased by her husband, Eugene M. Beattie, pilot for American Airlines and test pilot for General Electric Aviation; and her daughter, Mollie H. Beattie, former director of the U.S. Fish and Wildlife Service, as well as her parents, J. Russell and Harriet Clune Hanna; her brother, John “Jack” R. Hanna II; and her sister, Jane Hanna. Pat is lovingly remembered by her daughter, Jane H. Beattie of Ketchum, Idaho; her son-in-law, Rick Schwolsky of Boulder, Colo.; her brother, Mike C. Hanna and sister in law, Hazel Hanna, of Wayland, N.Y.; her grandson, Michael Seamus Harreys, and granddaughter-in-law, Miranda Harreys, of North Attleboro, Mass. ; her granddaughter, Sierra Crevier and grandson-in-law Bradford Crevier, of Jamaica Plain, Mass. ; and great-grandchildren, Liam and Mollie Harreys, in addition to many nieces, nephews and cousins. The Mass of Christian Burial was held at Sacred Heart Cathedral, 296 Flower City Park, in Rochester, on Thursday, Oct. 31, at 10:30 a.m. Interment followed at Holy Sepulchre Cemetery, 2461 Lake Ave., Rochester, N.Y. In lieu of flowers, memorial donations may be made to the Yellowstone Wolf Project at http://www.ypf.org/site/PageServer?pagename=WHAT_wildlife_wolf. Funeral arrangements by George F. Doherty & Sons Funeral Home, Dedham, Mass.